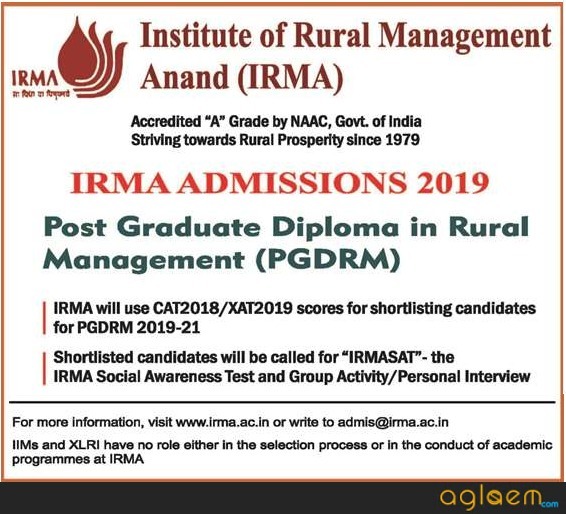 IRMA 2019- The Institute of Rural Management Anand (IRMA) conducts the entrance test, IRMA Social Awareness Test (IRMASAT) sometime in the month of February 2019. The list of shortlisted applicants for IRMASAT / Group Activity has been released on the official website. The Application Process for IRMASAT 2019 is over now. RMA will accept scores from CAT 2018/ XAT 2019 and IRMASAT 2019 for admission to the 40th Postgraduate Diploma in Rural Management (PGDRM) and 18th Fellow Program in Rural Management (FPRM). The candidates may check the details for IRMA 2019 from the article below. Latest: IRMA PGDRM 2019 final result has been declared. Click here to check the same. The candidates can fill the online application as per schedule. Applications must be submitted before the due date. Any application submitted afterwards will not be accepted by IRMA. The IRMA 2019 exam will be conducted in the month of February 2019. After the declaration of result, candidates shall have to undergo two more rounds- Group activity and Personal Interview. To apply for the courses offered by IRMA, candidates can check the eligibility from below. Qualification – The candidate must have a Bachelor’s degree from any discipline. Qualification – The candidate must possess a Bachelor’s degree in any stream from a recognized university. Anybody with a postgraduate or postgraduate equivalent degree/diploma from a recognized university or institution in any discipline with minimum 55% marks or equivalent grade can apply. (5% less for those eligible for reservations). Those expecting to complete the final exams of these degrees by July 01 2019 may also apply. The IRMA 2019 Admit Card made available via online mode on the official website of IRMA. The authority shall not send the hard copy of the hall ticket for the exam. It is mandatory for the candidates to bring the admit card along with a valid photo ID proof at the examination venue. The IRMA 2019 conducted in the month of February 2019. The exam shall be conducted in Online Mode. The examinees will be required to attempt 40 Multiple choice questions in 80 Minutes. The question paper will be in the English Language. For each correct answer, the candidate may be awarded 1 mark. There will be a Negative Marking of ¼ marks for every incorrect answer. Sample Paper: Click here to download the IRMASAT 2018 Sample Paper. Candidates would be able to check the IRMA 2019 Online Admission Test Result through the online portal of the institute at irma.ac.in. Shortlisted candidates will be called for Group Activity and Personal Interview. If the candidate qualifies the entrance test and the other two rounds of admission, they will be allowed to appear for the document verification and secure their seat by paying the fees of the course. IRMA will use CAT 2018 & XAT 2019 scores for shortlisting candidates. Shortlisted candidates will be called for IRMASAT 2019 – the IRMA Social Awareness Test and Group Activity & Personal Interview at IRMA. Click here to check the Selection process of IRMA Admission 2019 for PGDRM Course. 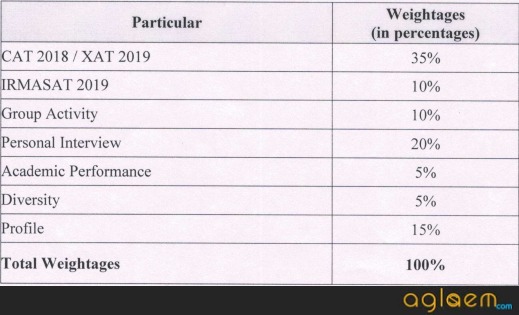 (taken on or after January 2014) / CAT2018/XAT2019 scores for PGDRM 2019 – 21. Online Personal Interview (OPI) will be conducted during last week of April 2019. CAT2018/XAT2019 scores and OPI score. The marks obtained in the GMAT / GRE Scores (taken on or after January 2014) / CAT2018/XAT2019 test and the marks obtained in OPI will be reduced to the equivalent marks of 60 and 40 respectively. An overall merit list will be prepared based on the total marks obtained out of these 100 marks. IRMA reserves the rights for considering an application under Profile Based Selection. Candidates should note that the mere fulfilment of minimum eligibility criteria will not ensure consideration for shortlisting for next stage of the Admissions process. Check the reservation policy of IRMA from below. The fee structure for Certificate in Rural Management (CRM) is equivalent to the fee structure of the First Academic Year. 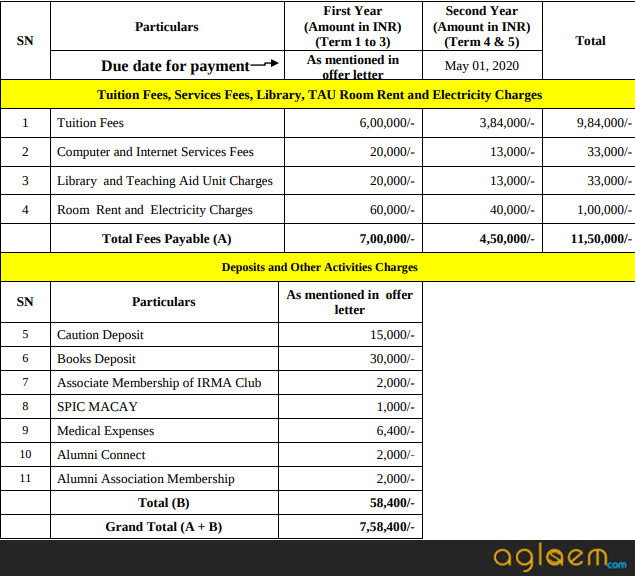 There may be an upward revision of the tuition fees and service fees. Mess is managed by the students’ body. Boarding and personal expenses will be over and above the mentioned fee. Currently, average monthly expenses of the mess is around Rs. 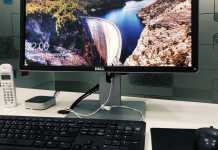 4,500/-. You are also required to pay Rs. 3000/- towards Students Activity Fund in the IRMA Student Mess at the time of joining. Please note that medical expenses mentioned above are to meet only the cost of services provided by the campus doctor and the Group Health Insurance of Rs.1,00,000/- taken by IRMA from any Insurance Company. Any other expenses have to be borne by the student. The Institute of Rural Management Anand (IRMA) was incorporated in the year 1979 by the Father of the White Revolution, Mr Verghese Kurien. It is a premier institute in rural management education and research in the country. It is located in Anand, Gujarat, and the courses offered by it are sought by the MBA aspirants. For more details on IRMA PGDM 2019 candidates can check download Information brochure. For more details on IRMA FPRM 2019 candidates can check download Information brochure.